In the 1950s, a group of scientists married these two discoveries together. They originally created a liquid product to eliminate bacteria in swimming pools and farm wells. The solution consisted of specifically formulated water that is unique and unrivalled in its therapeutic power for reversing many afflictions and illnesses. These scientists discovered how to encapsulate a nano-sized silver nucleus (10 nm) within a cluster of oxygen molecules. 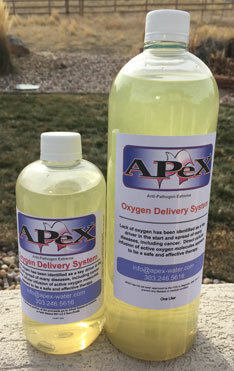 APeX Water is created by attaching a large number of oxygen molecules (clusters) to each silver particle, through a Covalent Bond. This forms what might be best called a silver-oxygen nano-cluster. The key to APeX Water is that the silver-oxygen nano-clusters are delivered past the cell membrane, into the heart of the cell. 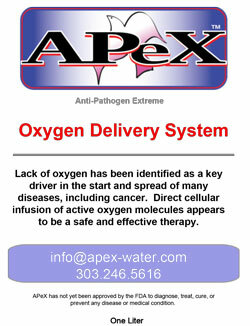 APeX Water is a direct cellular infusion oxygen delivery system. It has the ability to specifically rout out pathogenic cells. Then, one by one, it destroys them on contact, without any harm to healthy cells. The silver nano-nucleus within the oxygen clusters of APeX Water makes it unlike ionic and colloidal silver products that are currently thought of in the holistic community as natural antibiotics. Rather than influencing a direct effect on the body, as the ionic and colloidal silver products claim to do; the main function of APeX Water silver is to serve as a dolly to transport oxygen into pathogenic cells. In fact, the silver nucleus in APeX Water is so completely encased in active oxygen molecules that it has no physical contact with its surrounding microenvironment. The clusters of the silver/oxygen molecules have the ability to precisely hunt down and destroy pathogenic cells. Once the nano-clusters of oxygen have found their target, the cluster gives up its oxygen. This happens so quickly, within milliseconds, that the pathogens have no opportunity to mutate in their attempts to avoid the killer-oxygen-clusters (as they do typically with antibiotics and other therapies). Rather than accumulating, the APeX Water nano-clusters leave the body entirely within a couple of days. But, for all the time that the clusters remain present in the body, they go into all of the blood, all of the capillaries and vessels, and every place in the body where a pathogen may be living or lurking.